The Central Information on Friday endorsed the guidelines laid down by National Commission for Protection of Child Rights (NCPCR), for Eliminating Corporal Punishment in Schools. CIC Prof. Sridhar Acharyulu directed the School Boards to issue guidelines to the schools affiliated to them, stipulating that ‘corporal punishment-free environment’ would be one of the conditions for granting affiliation/recognition/NOC to them. It also directed them to stipulate that ‘practice of physical punishment/mental harassment’ would be one of the grounds for withdrawal of affiliation/recognition/NOC granted to them. The Commission was hearing an appeal filed by Mr. Bhramanand Mishra, who had sought a copy of the inquiry report regarding the alleged physical beating of a student by a teacher, Mr. Yagya Dutt Arya at KVS, Pilibhit. The information had been denied, claiming it to be third party information. Before the Commission, Mr. Mishra submitted that he needed the information so that his daughter could secure the custody of her children in the marital dispute against Mr. Arya. 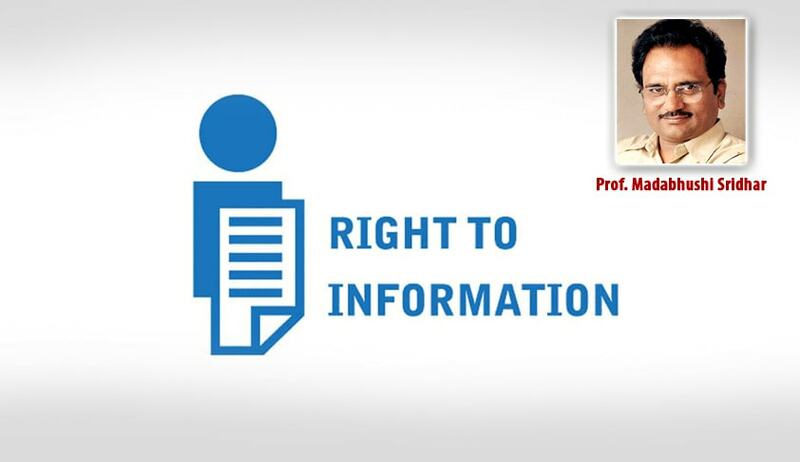 It hence ruled that even if the information was considered to be third party information, its disclosure would be justified in comparative public interest. The CIC also considered several provisions, and literature to opine that corporal punishment is not recognised by law, and that the same is violative of the right to live with dignity. It hence directed the State Governments and UT Administrations to designate appropriate local authority to redress grievances relating to corporal punishment and discrimination. The DCPS should function as the District Level Committee for the purpose of corporal punishment under the Chairpersonship of the District Collector/Magistrate/Deputy Commissioner and the concerned Sub-divisional Magistrate (SDM) should be its ex officio Member Secretary/Convener. The District Collector/Magistrate/Deputy Commissioner should receive the complaints of physical punishment, mental harassment and discrimination in schools and get these redressed within a reasonable timeframe. He may also take suo motu cognizance of grave cases of corporal punishment and to take remedial measures as per law expeditiously. Immediately upon being informed about the occurrence of a case of corporal punishment, it should be the duty of the SDM concerned to immediately ensure that the CPMC undertakes a preliminary fact-finding exercise. The preliminary enquiry should be completed within 7-10 days. In cases of suicide/sexual harassment/hospitalization resulting due to the action of a teacher/ staff of the school, the accused should be suspended immediately until the investigations by the SDM and police are over. If the preliminary enquiry report satisfies the CPMC with regard to the existence of a prima facie case, he may prefer a complaint in writing to the local police station within a month from the date of the incident. Thereafter, the case should be entrusted to the Child Welfare Officer (CWO) of the local police station to take it to the logical conclusion. The CWO should file the charge-sheet in the Court of the concerned Magistrate with a copy of the same being endorsed to the concerned SDM, preferably within 3 months from the date of registration of FIR. Once the enquiry by the SDM is complete, adequate compensation should be recommended to be paid by the State Government, which could recover the same from the school. The School Boards should maintain a multi-disciplinary panel of professionals (State-wise) for the purpose of independent enquiry into incidents of corporal punishment. They should constitute a Grievance Redressal Cell to receive complaints of corporal punishment and to take appropriate actions in such matters expeditiously. The Commission thereafter directed the KVS, headquarters and regional directors to voluntarily disclose formulation of a policy to eliminate corporal punishment, as advised by the NCPCR. It was also directed to disclose details of incidents of corporal punishments and action taken against liable teachers, amount of compensation paid to the victims, every year, beginning with 2015-16, within three months. Compensation to be paid to the victim was ordered to be deducted from the salary of the liable teacher. It recommended that each school publishes such a report every year. “It will go a long way in making school a place of pleasant learning free from assaults and humiliations,” the CIC observed.